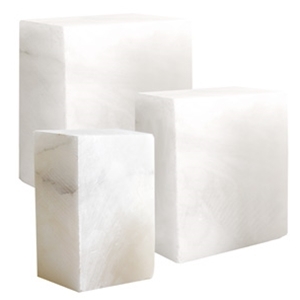 Imported from Italy these alabaster blocks eliminate the work required to reduce a stone boulder or slab for carving in the round (3-dimensional carving). Considered a medium hard stone, alabaster is a bit harder than soapstone. Opaque white. Approximate dimensions: 3 1/2" w by 5" d by 6 1/2" h.